UPDATE: Enjoy these projects from our former home. We’ve moved and are giving our new-to-us home a complete remodel. I’ve completely changed my style! Click HERE to take a look. This past year was chock-ful of diy fun with projects ranging from sewing/no-sewing to room makeovers and everything in-between. All of these projects are meant to inspire you and include a full tutorial in case you want to give one of them a try. 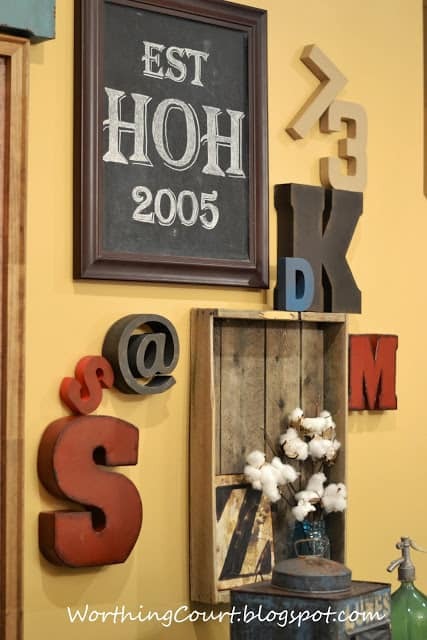 A couple of the most popular diy projects were a part of my basement family room makeover. I really wanted some old barn wood to go along with the rustic/vintage/industrial vibe I was going for in that room, but there was none to be found unless I wanted to hand over lots of $$$. So, I made my own! This project was very easy to do and turned out great. Another diy project for my family room was to repurpose some old and groddy bifold doors that came from the reno of our beach condo. There is an odd wall in our family room that needed more than just a picture hanging on it. 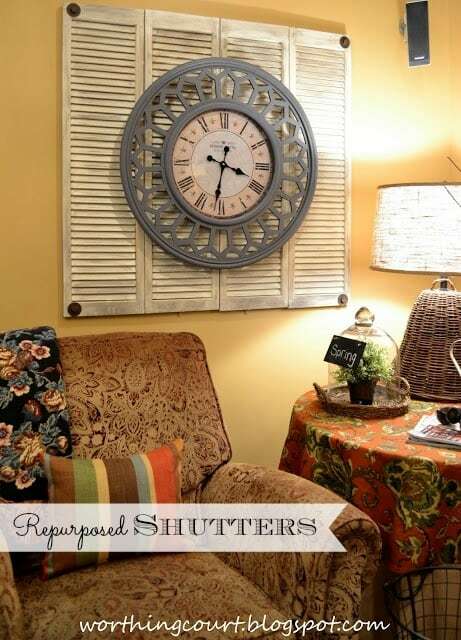 These shutters made a nice backdrop for an oversized clock and added some great texture to the room. Included is a super easy way to give brand new hardware a vintage look. I’m a pillow lover. How about you? In my book, you just can’t have too many pillows. I love to change them out for the different seasons and holidays, but – if you don’t sew they can be ridiculously expensive! 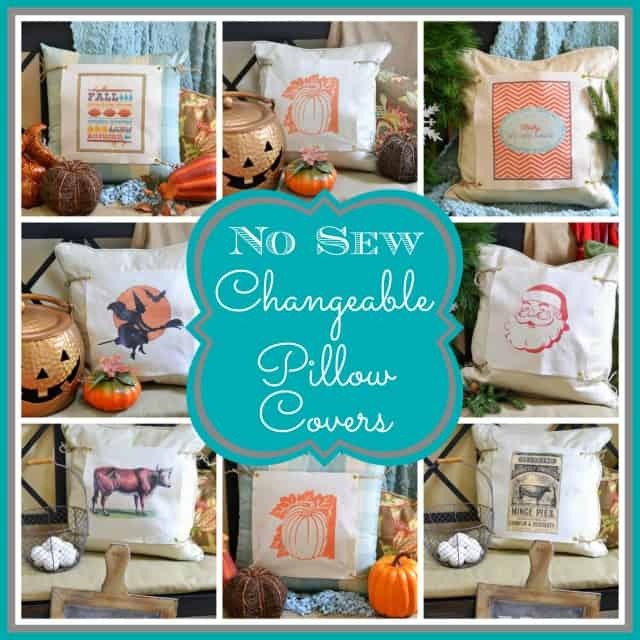 These no-sew pillow covers are my solution to the problem. They’re easy, inexpensive and fun to make and they look really cute too. 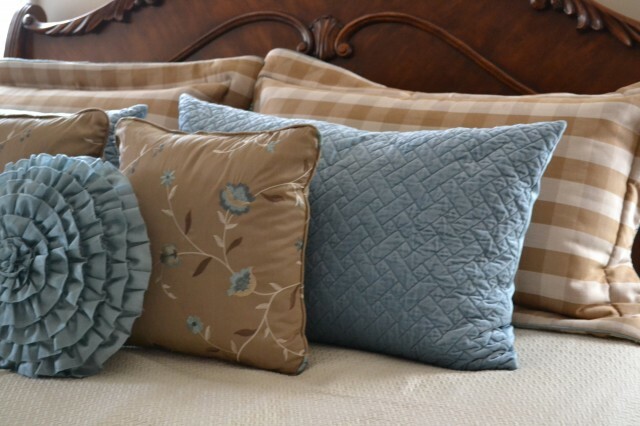 Bonus – they can be added to your existing pillows – no need to purchase new ones. I made these during the fall, but can’t wait to make some more for my front porch this spring. 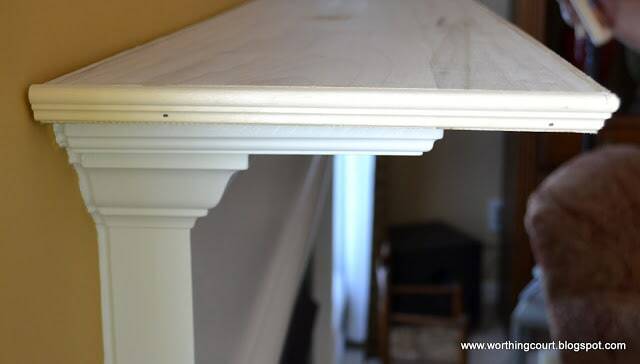 I made an upholstered cornice as a part of my powder room makeover. 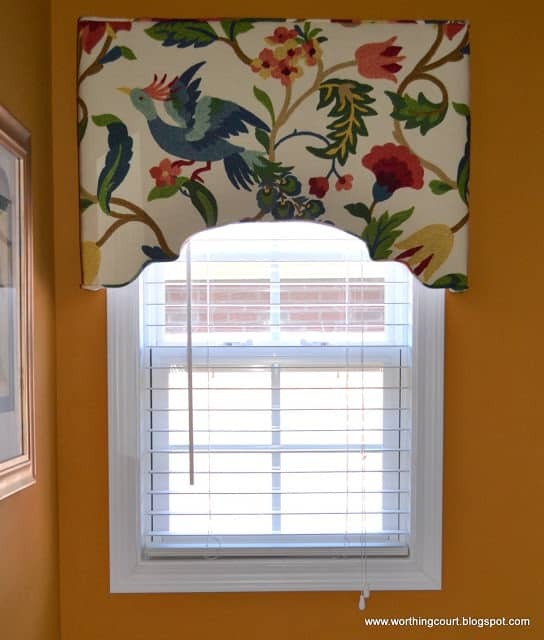 Upholstered cornices can look intimidating, but they really aren’t. A plus is that there doesn’t have to be any sewing involved. Follow these directions and you’ll get a professional finish every time. 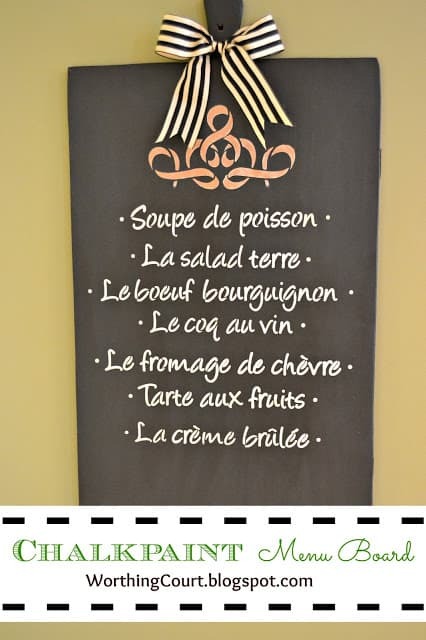 Rounding out the top 5, is this chalkpaint menu board that I made with my buddy, Amy, from Atta Girl Says. We made the menu boards during a class, but I shared the basic steps with you so you can easily make one of your own or else apply these directions to another chalkpaint project. 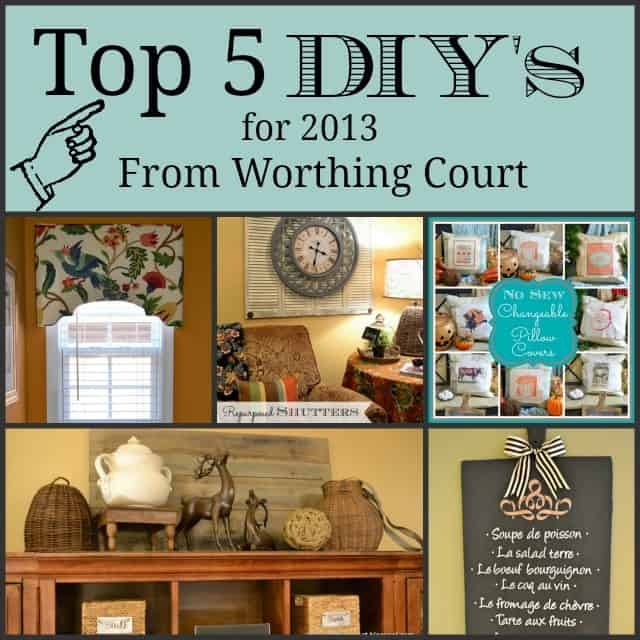 Here are few more diy projects prior to 2013 that you might be interested in. My goal for 2014 is to be organized in every aspect of my life! I’m right there with you! I’ve spent a lot of time the past few days working toward that very thing. Happy New Year! Thank you, Beverly. Happy New Year! Such great tutorials, Suzy, and all so useful! Have a Happy New Year. Happy New Year to you as well, Mary Beth! This is similar to what I do except I put everything in a box or if it takes more than one for each room. When I want to decorate the living room then the living room box is brought in and I do that room then go to another room and do that one. It works great for me. Hi Judy. I assume you’re talking about putting your Christmas decorations away? I love your idea of putting the decorations for each room into its own box! Hi Christy. 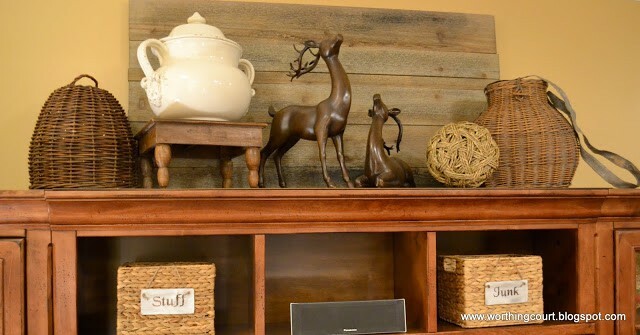 Adding the space to my mantel was one of the best things I ever did! Happy New Year to you and your loved ones. Wow! All of those were great tutorials. I absolutely love that upholstered cornice! Wishing you the best in 2014! Happy New Year to you as well, Pat! So many wonderful projects Suzy! I love your perfect chalkboard art tutorial, I don’t know why it never occurred to me to sharpen my chalk, duh! 🙂 Wishing you a Happy New Year! Hi Mary. It was a real eye-opener when it occurred to me to sharpen my chalk. I had the same reaction as you – duh! lol I hope you and your loved ones have wonderful 2014! Suzy your projects were great, I loved them all. My favorite was the bookshelves for the beach condo. That was amazing. Happy New Year to you and Bob, Ginger! 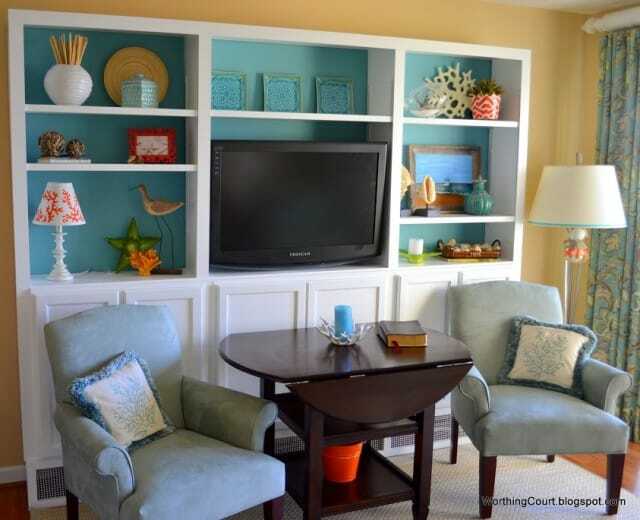 Those bookshelves at the beach might just be my favorite project too! Kisses and hugs, sweet friend.